Invariably simple to produce and devastatingly delicious, pesto is almost certainly the last word in quick, easy and frugal meals. 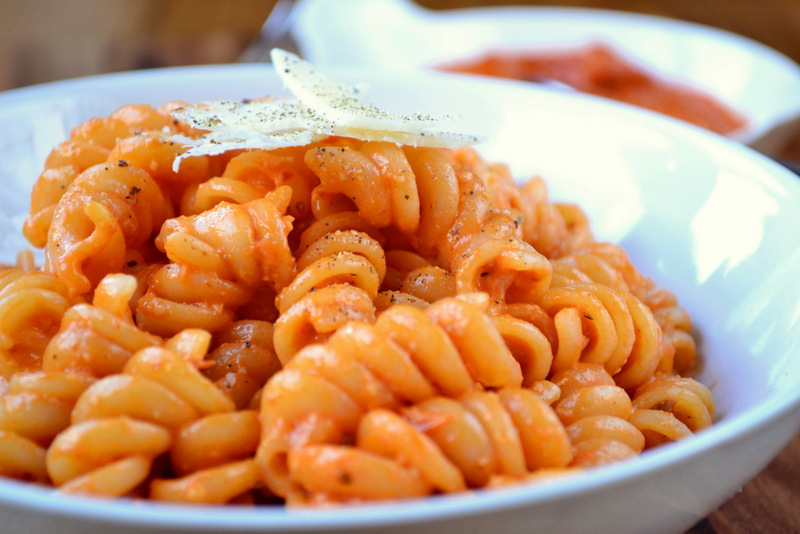 Of course, it has applications outside the world of fusilli (basil pesto is, for instance, a rather delicious addition to soup), but that’s where its heart shall forever rest. 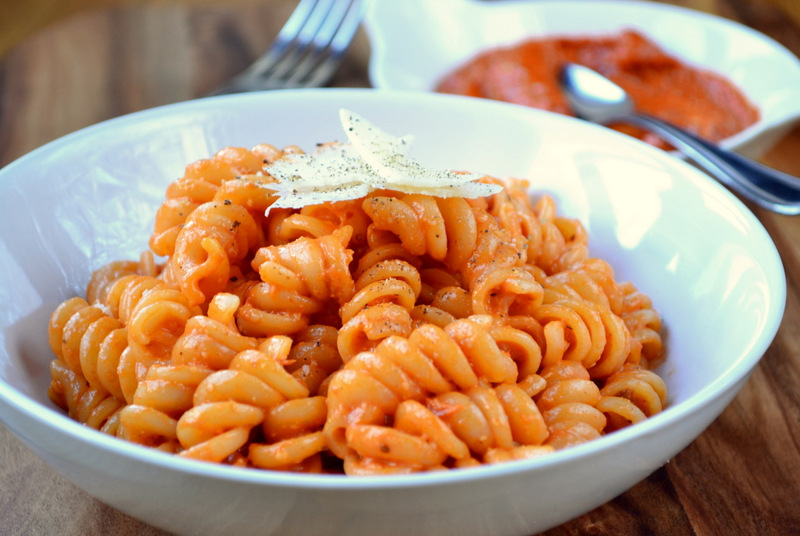 For example, take this roasted red pepper pesto – in order for one’s pasta to obtain a satisfactory demise, all one need do is roast some fruit along with a little garlic, blitz it up with a few added extras and yell “Bob’s my uncle” at the top of one’s lungs. You’ll be glad to hear that the last step is not, and hopefully never will be, obligatory. The number of different types of pesto one could dream up could, quite possibly, stretch on into eternity. However, this recipe has become a stand-out favourite since, unlike this rocket pesto, it deviates firmly from the norm. Indeed, most pesto is decidedly green, though it can be made from pretty much every herb under the sun. As you might imagine, the flavour attained by this recipe also differs from the norm somewhat – rather than being on the fragrant side, it is rich and almost caramel. Roasted garlic is, no doubt, responsible for the presence of that particular culinary facet – and a most welcome one it is too! Enjoy! 2. Throw everything in a food processor and whiz until it has become a paste – you may need to add another tbsp of olive oil, just to loosen it up a bit. Cost: If one is committed to being frugal it is possible to find peppers at an extremely reasonable price – two for 70p isn’t that much of a stretch. As such, this very flavourful pesto can be made for around £1.30 – a most tempting price! Great roasted pepper pic. And it seems pretty healthy to me! How badly do I want a big bowl of that pasta RIGHT NOW. I’m definitely making this!! Indeed! I’ll check them out! Thank God for Google translate sometimes though, huh? Indeed, it could be used for some many things! As always your food/recipes look amazing! Cheers. When you say red peppers, do you mean bell peppers, capsicum? It doesn’t matter really, those work well though. Not chillies, mind you. This looks so amazing and your pics are wonderful….mouth watering! Let me know how it goes down! So, so well. I used plenty of chilli for extra heat and it was really delicious. Thank you! This just went on my to do list. Thanks for the post! This looks delicious! And nice photos. Oh dear. I am going to have to make this. 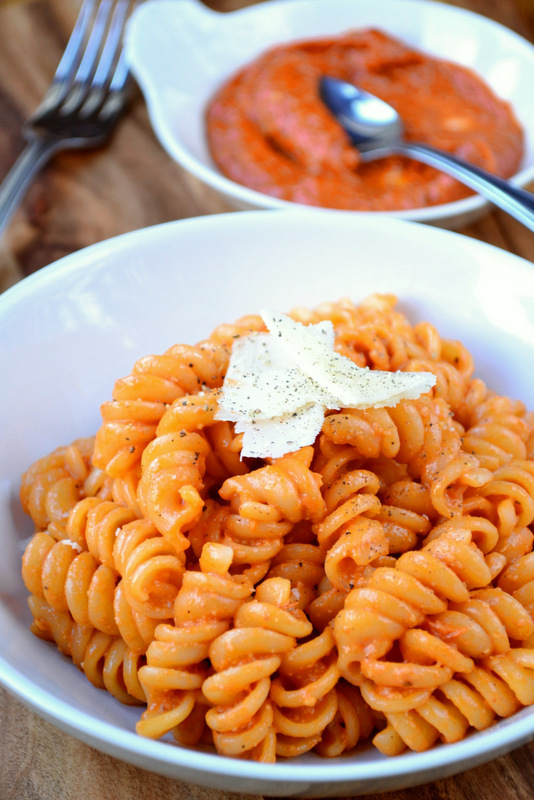 I adore roasted red pepper…but for some reason I never thought of making it myself. And pesto of any kind is perfection. Thanks for this! Oh you must try it – it’s very simple. Also, do you know if the red pepper pesto will freeze tolerably well? Thanks again for the recipe. Amazing! Haha! Fantastic. I have no idea, but it’ll probably last well in the fridge. That looks great. I never add walnuts to pesto or pine nuts. So there’s even more combos there. Anyway, I haven’t tried this one. So that’ll go on the list. Walnuts go very well, Greg! So simple, but yummy. Love the recipe. I’ll be giving this a go. This looks and sounds delicious! I will most certainly be giving this a try myself! Definitely – but more difficult to photograph. Elegance on a plate! Love the reds; looks delicious! I think I could eat fifty bowls of that pasta. Oh boy…this could be bad! Okay, but it’ll take some serious self-restraint. Thanks so much for sharing that recipe – I can’t wait to give it a try! Haha – I’m sure! No problem, glad you enjoy my stuff. Awesome – enjoy the recipes! Yumm! This is on my list to make. Delicious! What if you don’t have a food processor? a pestle and mortar would work. Ridiculously easy and looks so delicious! Thanks, Amanda – it was SO simple. Beautiful photos you have here. Beautiful and vibrant. Love the idea of having a red chili pepper in there to give it some heat to this pesto. Lovely post. So I was gonna try and eat less pasta, figuring all that white flour wasnt doing me any good. Now, living in Italy at the moment this is difficult enough as there is delicious pasta all around me. But now you also post amazing looking pesto dishes and it will become even more difficult! By the way, I love that you used walnuts as well – definitely more frugal than pinenuts (which they sell here with a security seal similar for alcohol bottles due to the price I reckon) and I am sure give this a lovely earthy taste (which is why I prefer using walnuts to pinenuts when making beetroot pesto). Stunning pictures as well! Naaaah, pasta’s fine :D. Walnuts are nicer than pine nuts too! Thanks! I love different pestos. This sounds lovely. Looks delicious! And what a great idea. I’m sure the pesto could be added to simple tomato soup for a delicious roast-y flavor as well. Versatile and frugal, a great combination. Great job! thanks! yes, that’s a good idea! Hehe – thanks, Shira! ’twas soulful. Beautiful and delicious! Trying this recipe tonight! So delicious Nick – I could eat a big bowl of that right now 🙂 I love anything with roast peppers it is such a fantastic taste! What a wonderful idea…love it! this looks fabulous, i can’t wait to try it!! Looks fantastic, Nick! The color is the best, isn’t it? yes, but damn hard to photograph. True. There are some things that are really hard to capture properly. But you always do a fine job! Oh, that looks fab! Wish I could have a bowl right now as I sit here catching up on e-mails! roasted garlic and peppers are always delicious aren’t they. Looks delicious. I am a bit of a pesto addict myself! This one sounds so delicious, I loooove roasted garlic in anything so I am thinking this is definitely dinner tonight, thanks for the inspiration Frug! Thanks, Natalie! IT really makes a divine dish! i like the looks of this….. I will be making this ASAP! Yum! It looks and sounds delicious 🙂 I’m pinning this one – thanks for sharing! This looks really really yummy!!! 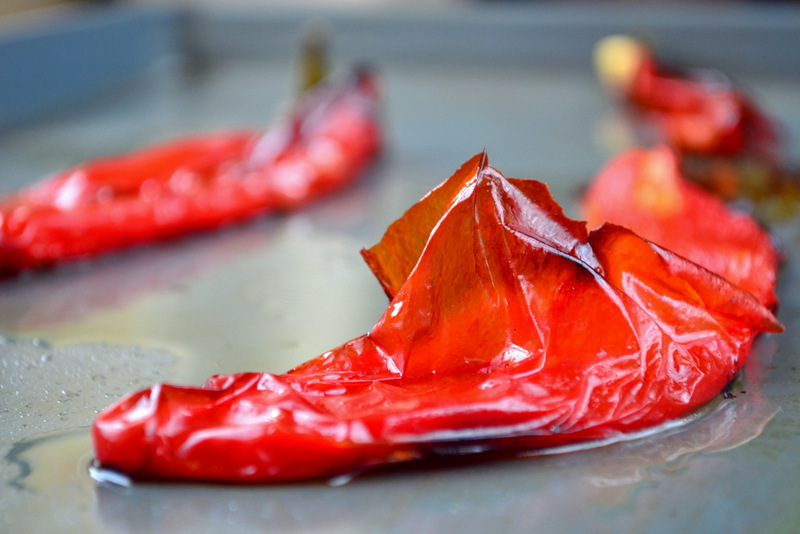 I have to say that I’m not a fan of roasting peppers, but I’ll do it just for this recipe. It looks so creamy! you should. I’m surprised though, roasted peppers are to-die-for! Those pictures are gorgeous. Really. You always take such great photos that make me want to eat the computer screen. You really have great recipes and great photos! I love them and this I will try, we have lots of peppers in the summer and fall around here and I am always looking for great ways to prepare them. When you grow your own, it is really frugal! 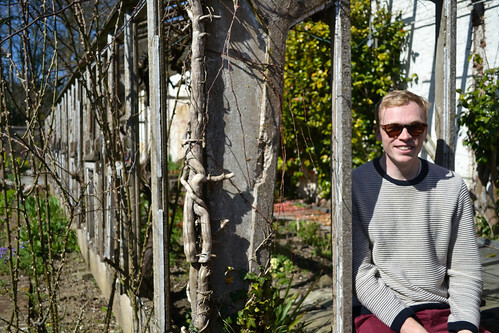 thank you so much – growing your own is definitely the best way. An absolutely wonderful idea! I love making pesto since it can be the base for just about anything you cook, so it’s nice to have a good repertoire of different ingredients for pesto! I love rocket too but boy this sounds exciting. Trying this this weekend. Yum. I’ve got an obsession with roasted red peppers at the moment and have been making vegan cheez with them. I imagine it would be easy to veganize this with a bit of nutritional yeast subbing for the cheese. Fantastic Nick! Interesting… I have no input to give when it comes to adding nutritional yeast to anything… :D. Thanks, Somer! This looks great! Going to try it this afternoon! A little question: how long do you think it can keep in the fridge? I have a LOT of red peppers to use! Thank you for the recipe! I’d be happy keeping it for 3 days – but it will freeze.